The guzheng is a fascinating mix of new and old. The modern instrument is a product of the 1960s - but like the electric guitar it traces its origins to earlier instruments. Unlike the electric guitar, its predecessors date from 6th century BCE in China or earlier. That's 2600+ years of history to tell you! If dates and lists of details are more your speed, head over to the Guzheng Timelines page. Dr. Ferguson: Ferguson, D. L. (1979). Modern Performance Techniques for the Chinese Zither Cheng. University of California Los Angeles Master's Thesis. Our story begins long, long ago in a land far, far away-or maybe right where you are sitting. Someone tied thin strands between two points and plucked them. They made a sound. By tightening and loosening the strands they found they could change the pitch. By changing the material the strings were made of or by changing what they were attached to, they realized they could make a whole variety of noises. This happened all over the world. Untold numbers of people discovered the magic of wringing sound from taut lines. In China, it happened so long ago we don't know the earliest origins. But we do know that sometime in the past people were playing musical instruments capable of astounding music. (2) Some of the instruments might remind us of the guitars and banjos of today - but others were more like planks with strings of different length. "The guzheng!" you might cry! Well, you'd be half right. To talk about the guzheng we have to clear something up. The name "guzheng" is two characters, 古 and 筝 (Gǔ and zhēng). Gǔ means ancient and zhēng means zither. Those early board and string instruments were definitely zithers but they were very different from the 古筝 of today. Early writings use "zheng" to mean "zither"; they aren't specific. At some point zheng came to mean the guzheng and its direct predecessors. Keep that in mind as we explore: I use zheng for guzheng predecessors and zither for the broad category that includes many different instruments. Two such zithers are the sè (瑟) and the qín (琴). Think of them as two ends of a zither spectrum. The sè is on the large and complex side of the spectrum. It was longer and deeper than a modern guzheng and has featured 25-50 strings over its history. (3) The early qín was on the simpler side. It had around 5-7 strings, no moveable bridges, and was far smaller. The wonderful guzheng, sitting now at 21 strings, fits right in the middle. These three instruments developed along intertwining paths. To talk about their history we need to figure out at what point their predecessors diverged to become qín, sè, or guzheng... or if they ever did. It's surprisingly difficult. To apply the classification conventions of today without time travel we'd need the ancient writers and their sources to explain the differences between these instruments down to the smallest detail. We'd need them to explain it like experts today might explain the differences between a fiddle, a viol, and a violin. Unfortunately, the records we have struggle to distinguish between a violin and a cello. Instruments were instead described more holistically and subjectively. Instruments varied maker to maker and region to region so why bother trying to standardize all that? Ancient records also used the same characters to refer to multiple instruments we now consider different, so figuring out what exactly any given reference is referring to can be challenging. One metric we modern folk get hung up on is the number of strings on the instrument. That's a decent enough strategy on the standardized instruments of today but it doesn't really work for identifying instruments in the past. Writings claim the sè has had 50, 27, 25, 23, and 19 string varieties, while the qín has had 5, 7, and possibly 10 strings. If that's not challenging enough, there are references in English-language sources to zithers that had 30, 13, and 10 strings in the 18 and 1900s . Even if we limit ourselves to the best English-language guzheng resources out there, Dr. Han cites 5, 12, 13, 14, 15, 16, 18, 21, and 26 strings. Another researcher, Gaywood, cites guzheng predecessors growing from 6, 7, 9, 10, and 14-string variants to 16 or 21 strings by the 1900s. All of this means: String are fun to count but don't tell us what instrument a zither might have been. Let's start with the oldest information we have access to: Legends! A third legend says the famous general Méng Tián (蒙恬) from the Qin dynasty had a hand in shaping what would become the zheng. My Chinese is not good enough to relate the story, so all I can say is that Méng Tián added string(s) and/or changed the shape of an existing instrument to improve its function and possibly use it for psychological warfare. He died around 210 BCE so the timelines don't quite line up, but perhaps he encountered a split sè and got to thinking? From that point on we know that sè, some zheng-like instruments, qíns, and their oft-forgotten hammer-struck relative the zhù (筑) gained in popularity. The various zhengs became favored for banquets and celebrations while the qín became a scholar's meditative tool thanks to its praise by Confucius and its subsequent inclusion in the practice of his philosophy, Confucianism. The qin gained great prestige as a tool for self-betterment among the higher classes in the thousand years that followed from the Qin to Tang dynasties (206 BCE to 906 CE). The zhengs stayed in the realm of entertainment, rising and falling in popularity as any art form does. Sometime between the end of the Tang dynasty (a great time for music in China) and the beginning of the Ming (not such a great time for music) the people in nowadays Vietnam were sharing musical ideas with nowadays China. Who made it first I don't know, but the end result was the creation of a southern-style of the Chinese zheng that looks incredibly similar to the Vietnamese zither the Đàn tranh. You can still find zheng made in this style- But ah, I'm getting ahead of myself. Let's get back into the flow of time. Over the next few centuries the banquet music that included zheng faded in popularity. By the beginning of the Ming dynasty, about 1368, banquet music and the zheng were abandoned by the upper classes completely. They were kicked out of the hallowed and somewhat restricted halls of the rich and became an instrument of the people. This fall from grace is a big deal and a large part of why we have the guzheng today. Freed from the restrictive protocol of the courts, the zheng's player base, repertoire, and (I'm guessing) play styles expanded. As music changed in the next few centuries and new types of performances became popular, the zhengs joined the growing library of Chinese instruments that adapted to that demand. They pursued those changes without unifying standards, allowing 12, 13, 14, 15, and 16-stringed instruments to exist and spread in multiple regions simultaneously. The qin, by contrast, was guided by the Confucius-based ideals that limited it to 7 strings and a rather specific shape. Scene from The Four Accomplishments, painting from the 18th or 19th centuries. Image fromThe Center for the Art of East Asia, University of Chicago. That separation from the upper classes made the zheng a candidate for standardization and redesign. Its use could connect the modern times to what was viewed as the positive aspects of the past without bringing in the negative aspects. As hostilities wore down zheng-related events moved quickly. The government used music to promote its positions after the civil war. It formalized musical education, recast old songs with new lyrics, and redesigned instruments to better fit its intended presentation of the country. A system of Conservatory schools was started. Musicians who had been studying western musical instruments were instructed to learn traditional Chinese instruments instead. the addition of 5 more strings to the popular 16-string guzheng, making it capable of covering 4 octaves at once. changing the strings from metal wire to nylon-wrapped wire. replacing the straight fixed bridge at the tail of the instrument with a curving "S"-shaped bridge. All of these changes are captured by the Shanghai-based Dūnhuáng (敦煌) brand that patented the new, combined design in 1965. Alongside the physical changes, zheng music and play styles were changing as well. Musicians Wáng Chāngyuán (王昌元) performed the guzheng solo "Battling the Typhoon" at a concert attended by Jiāng Qīng (江青) who came to favor the piece. Jiāng Qīng was the wife of the Chinese Leader Chairman Mao. She used her position to promote the song. "Battling the Typhoon" became one of the most played and consulted pieces of music during that time. This, in turn, led to a massive increase in the guzheng's popularity. In the last few decades the guzheng has continued to receive a lot of attention and experimentation. Mechanisms were added to make key changing and diatonic scales possible, string counts and bridge arrangements have been adjusted, and there has even been a multi-year effort to build an electric guzheng. Head over to the Guzheng Varieties page to have a look at all these ingenious changes for yourself, or look into the specific dates on the Timelines page. And if you know more about the events I've missed, or have photos of different instruments that you would like to share, please email me through the form below! (1): It seems every country in East and Southeast Asia has had some interaction with zheng-like instruments somewhere in their history. From Mongolia to Korea and Japan to Singapore, different people have created different techniques and have their own perspective on the instrument. With the community's help, I hope to expand this site to cover more countries. If you have information and sources to point me to, please send me an email through the form below. 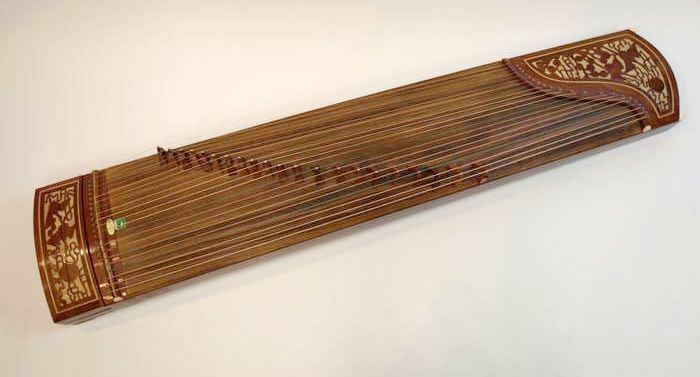 (2): The oldest guzheng-like instrument found so far dates to about 598 BCE and was discovered in Guxi county in Jiangxi province in Southern China in 1979 (贵溪, Guìxī, 江西, Jiāngxī). A few years later, depictions of a zither were found in a tomb excavated in Zhejiang, about 200 miles away (浙江, Zhèjiāng). That's as far back as any physical record I know of, but that's more than enough of a starting point. (3): Hearsay on the internet is that the 大同樂會 (Dà tóng yuè huì, a musical collective/program set up in Shanghai from 1920-1937) sourced a 50-string sè. I haven't confirmed this, though I do have a picture on the Other Zithers page. (b) Tang Shun-Zhi, ed., Jing-Chuan Bai Bian (The Miscellanies of Jing-Chuan) (completed in the Ming Dynasty, 1581; rpt. Taipei: Xinxing Book Co., Ltd., 1972), Vol. 5, p. 2894. (5a) To identify zhengs in sources I've looked for the character (筝), the romanizations "Zheng", "Cheng", or "Tseng", and for sources to articulate that the instrument they are talking about is neither a qín nor sè. More generally speaking I've assumed something is a zheng if the source talks about a zither that has less than 20 strings and wasn't a qin. If the source was a language I couldn't read, I've relied on secondary translations and the expertise of those who have come before me. If you'd like an in-depth discussions of the origin of zithers in China, check out John Thompson's website Silk Qin. (5b) If choosing between "zheng" and "guzheng" aren't already confusing enough, let me make things even more complicated. "Zheng" and "Guzheng" are both singular and plural. The plural of guzheng is guzheng. 1 guzheng, 5 guzheng. When I say "zhengs" with an "s" it's to indicate that multiple types of zheng are grouped together. (8): Chinese history is complex; in depth discussion is, unfortunately, far outside the scope of a website about a musical instrument. For those interested in a longer take, consider Lazlo Montgomery's China History Podcast. The civil war is covered in 4 parts in episodes 119-122.